On the island of Patmos, in the main church of the Monastery of Saint John the Theologian, is a western-style image of the Holy Mandylion dating to the end of the 18th or beginning of the 19th century. It seems almost out of place inside the old temple filled with Byzantine-styled frescoes. 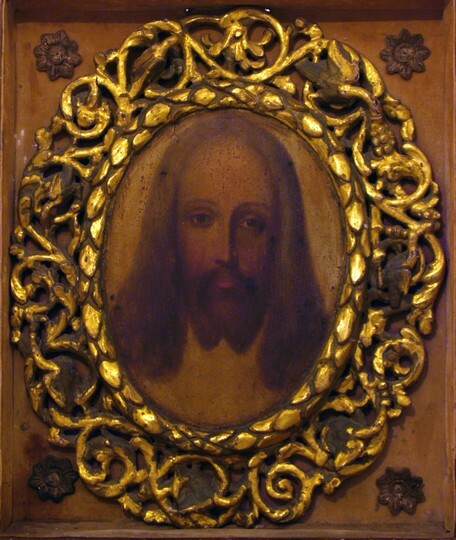 Artistically it is less interesting than anything around it, being a simple image on wood with a wood-carved frame, but it has a fascinating history in and of itself, especially how it came to be displayed in the most sacred church on the island. The story begins in 1925, when a woman named Irene Kountouris was left alone and abandoned in her poor and simple home on the island of Patmos with her two chidren, after her husband decided to abandon his family and migrate to America in hope of finding a better life for himself. 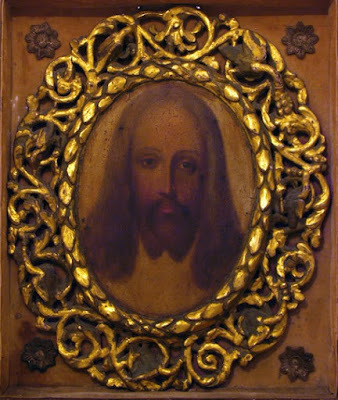 The impoverished mother, in her final hope of helping her family to survive, decided to sell her beloved icon of Christ depicted as the Holy Mandylion. She sold the icon to a British archaeologist for a large fee, and received half the cost in advance as a down payment, which was 50 golden British pounds. The following morning Irene told her children to kiss the beloved family icon of "Christouli" for the last time before they went to school, revealing to them that she had sold the icon. Upon hearing this the children began to weep with deep sorrow, urging their mother against such an action. As they wept they looked towards the icon of Christ, and they all witnessed that it too was weeping. In fact, the flow of the tears was so great that when news spread of the miracle and people from all over the island came to the house to witness it, they were all able to take with them some of the tears on cotton as a blessing. Irene immediately sent a telegraph to her husband of the miracle of Christ, so he postponed his new life in America and returned home where he financially helped his family. The icon itself was then first transferred to the Monastery of the Holy of Holies on the island of Patmos, and from there was placed in the Skevophylakion of the Monastery of Saint John the Theologian.